Of course, the simplest constraints present the greatest challenges. Kids Under Cover supports youth at risk of homelessness due to conflict or overcrowding at home. Its annual challenge invites architects to design structures that are then auctioned off to raise money for the charity. 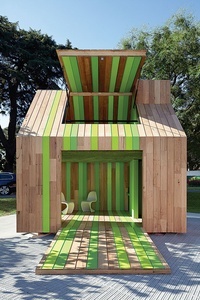 The brief: a cubby built from donated materials, at a maximum weight of 2000 kilograms and maximum footprint of three metres by 2.5 metres by three metres; it must withstand transportation at one hundred kilometres per hour and several crane drops, as well as the general public across five installation days prior to the charity auction. It’s an innovative approach where design thinking plays a direct role in addressing complex problems. Open House opens towards the ground and towards the sky, and then closes up into a single form. Vivid green stripes stand in for Dorothy’s yellow bricks, drawing the eye and the imagination as they lead you into the space. Open, it’s Gaston Bachelard’s oneiric house, complete with kitchen nook and roof-window attic. Closed, its sealed wooden shape is instantly recognizable: an originary form, a Monopoly piece, the crayon house you sketched on paper that once seemed so very big. This isn’t the first cubby Brett has designed as an adult. A family collaboration transforming an awkward garden corner, his 2009 Cubby-Box was entered in the Residential: Houses category of the Australian Institute of Architects Awards. This rare typology for furtive play continues to provoke the designers at Nixon Tulloch Fortey, who see the cubby as a space “that could take on multiple identities.” Here, the innovation is in a carefully crafted approach: Open House is a giant wooden toy as well as a space for play. While competitors chose materials such as milk crates, compacted wheat and rice panels, Nixon Tulloch Fortey privileged the sensitivity and care encapsulated in our sense of home. Open House is a sophisticated resolution of adult problems at children’s scale. This entry was posted in CRITIQUE and tagged architecture, play. Bookmark the permalink.